Online blackjack tournaments are a relatively new offering. Blackjack itself can be traced back to 17th century Europe. Since then, it has grown to such an extent that it is considered to be the most popular of all casino games worldwide. Even the smallest gaming establishments will host at least one blackjack table. Internet gambling has made the game even more accessible. Online tournaments have become all the rage. This is due in large part to the fascination with poker tournaments such as the WSOP. Blackjack, another game that requires an element of skill in order to be successful is cashing in on the trend with the proliferation of online blackjack tournaments. Just like with poker, players can register for Freeroll tournaments where they compete for real cash winnings or entry into higher stakes online blackjack tournaments. Traditionally, in a game of blackjack, players compete directly against the dealer. There might be other players at the table, but the outcome of one player’s wager has no bearing on any of the other players. Online blackjack tournaments turn the traditional blackjack game on its head. 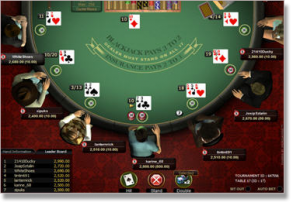 In an online blackjack tournament, players aren’t just pitted against the dealer. They must also battle against the other players in an effort to win the most money. When entering an online blackjack tournament, you are given a predetermined amount of chips to use when playing. The chips have no real value. They are simply a means of tracking the tournament leaders. At designated intervals the players with the most chips advance toward the final round, which usually consists of six players. The player with the most chips at the end of an online blackjack tournament receives the biggest cash reward or prize. Other finalists will usually receive cash or prizes as well; just smaller amounts. Other versions of online blackjack tournaments, such as Elimination Blackjack, differ slightly. In Elimination Blackjack, players that have the least amount of chips at the end of each round are eliminated. Consequently, the remaining players must adjust their playing strategy constantly. Occasionally, players who are eliminated are able to buy their way back into the game. Another difference between traditional blackjack and online blackjack tournaments is the use of a dealer button. In a classic game of blackjack the cards are dealt around the table in the usual order. Because there is an advantage to betting after the other players is a considerable advantage. Therefore, in online blackjack tournaments a dealer button is moved clockwise following each hand which changes the betting order. Traditional blackjack tournaments are similar to online blackjack tournaments. However, there are some differences which are outlined below. Game Speed – Online blackjack tournaments operate at a faster pace than traditional blackjack tournaments. The reason for this is that there are fewer distractions when playing online and the technology allows for a more rapid shuffling of the cards and automated betting. Social Component – In a traditional blackjack tournament there is room for plenty of social interactions between the players and the dealer. Players can communicate via online chat during most online blackjack tournaments but the degree and quality of these interactions isn’t quite as high. Environment – Playing from home allows players to concentrate better when playing in online blackjack tournaments. These players have complete control over their environment, whereas playing in a casino can be highly distracting. Economical and Convenient – Playing in traditional blackjack tournaments requires a trip to the casino, which may or may not involve flight and hotel costs. When playing in online blackjack tournaments there are no travel expenses involved and you can even play in your pyjamas!